(MENAFN - Colombo Gazette) wp-image-124258" src="https://i1.wp.com/colombogazette.com/wp-content/uploads/2018/03/MaldivesNaijaNeduDotCom.jpg?resize=235%2C151" alt="" width="235" height="151" data-recalc-dims="1" />The Maldives Police Service advised and appealed to the public to refrain from creating unrest, and incitement to violent and unlawful protest. Four individuals suspected of planning and inciting violent protests have currently been detained by the Police. According to the Police, investigations are ongoing and more arrests are possible as further information comes to light. The Police further noted that they would be carrying out special operations to prevent unlawful actions, as identified by Police intelligence. The service will follow due procedure and the law to prevent such unlawful actions, the Police said. Further, the Police denied recent rumours that those arrested during earlier protests were currently in custody, noting that all who were detained during protests have now been released. The Police went on to note, with appreciation, the respect for the law and public peace in recent gatherings. The service will continue to work to maintain public peace, within democratic principles and proper police code of conduct, the Police said. Maldives President Abdulla Yameen Abdul Gayoom, on 5 February 2018 declared a State of Emergency. As per the Presidential Decree, the state of emergency was enforced in order to protect the peace and welfare of all citizens and the country, following the events that unfolded in relation to a Supreme Court order issued on 1 February 2018 which the Maldives Government says resulted in the disruption of the functions of the executive power and the State institutions vested with specific mandates under the Constitution, the infringement of national security and public interest, and if implemented, which would potentially lead to an undermining of the supremacy of the Constitution of the Republic of Maldives. 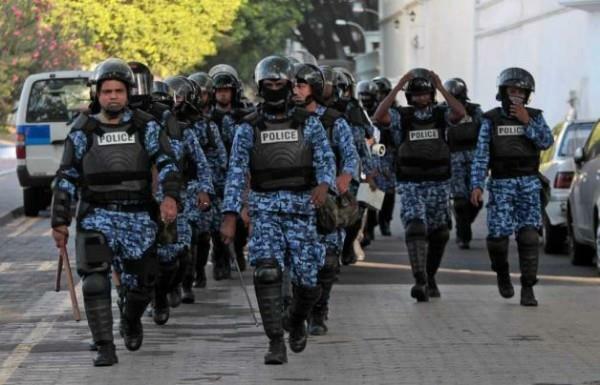 The Maldives opposition and diplomatic missions have raised concerns over the state of emergency.